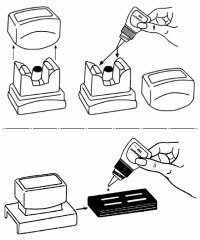 If your self-inking stamp impressions are getting light, you can re-ink your stamps using our step-by-step pictures with instructions below. Often, just re-inking your custom stamp can prolong the life of the stamp, and allow it to make a great impression! Push stamp down slightly (Image 1). Pull out ink pad (Image 2) and add 10 - 20 drops of Trodat / Ideal Ink on the inked side of the pad. Once the ink has absorbed into the pad, push the pad back in. Push stamp down slightly and push buttons on side to lock into position. Put 10 - 20 drops of Trodat / Ideal Ink on the inked side of the pad. Re-Inking 2000 Plus Stamps - NEW STYLE! Push down slightly on the stamp – about 1/8” (Image 1). Lock the stamp in position using the locks on both sides of the stamp (Image 2). Remove the ink pad by pushing on the pad (Image 3). Re-ink the pad, applying 10 – 20 drops of 2000+ Stamp Ink. Allow the ink to absorb into the stamp pad. Replace the stamp pad in the stamp (Image 3). Remove the ink pad by pulling on the edge on the pad (Image 1). Re-ink the pad by applying 10 – 20 drops of 2000+ Stamp Ink (Image 2). Replace the stamp pad in the stamp. You must use MaxLight Ink, since another brand's formula will not mix with MaxLight and may damage your stamp. Remove the handle and add the ink as follows. If there are 2 ports, divide the ink evenly between the 2 ports. Replace the handle and allow to sit for 5 minutes. Occasionally, you may see lint or paper dust on your MaxLight surface. Simply place a piece of cellophane tape across the die of the stamp, rub your finger over the tape, then remove the tape. The tape will lift off the residue. Remove the clear plastic cover and the stamp index with your text on it (Image 1). You will see two oblong holes and be able to see through all the way to the ink pad. Add 3 to 4 drops of MaxLight ink to each of the oblong ports (Image 2). You must use MaxLight Ink, since another brand's formula will not mix with MaxLight and may damage your stamp. Replace the index and clear plastic cover. Remove the dust cover on the bottom of the stamp (Image 1). Slid the stamp body sideways out of the handle of the stamp (Image 2). Put the stamp body on some scrap paper as there may be some ink bleed. You will see three oblong holes and you will be able to see through all the way to the ink pad. 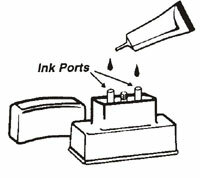 Add 3 to 4 drops of ink to each of the oblong ports (Image 3).You must use MaxLight Ink, since another brand's formula will not mix with MaxLight and may damage your stamp. Slide the stamp body sideways back into the stamp handle (Image 2). 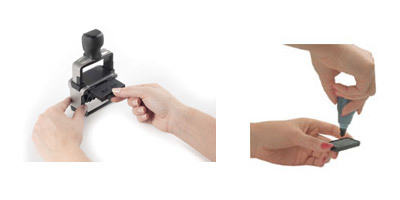 Most XStampers only require between 2 to 6 drops of ink. You must use XStamper Ink, since another brand's formula may not mix with XStamper and may damage your XStamper. Occasionally, you may see lint or paper dust on your XStamper surface. Simply place a piece of cellophane tape across the die of the stamp, rub your finger over the tape, then remove the tape. The tape will lift off the residue. Re-inking must be performed at such time when the stamp impression has become consistently light. XStampers industrial stamps can be refilled through the back by removing the handle. They were designed this way to keep your hands clean and ink free. You must use XStamper Quick Dry Ink, since another brand's formula may not mix with XStamper and may damage your XStamper.